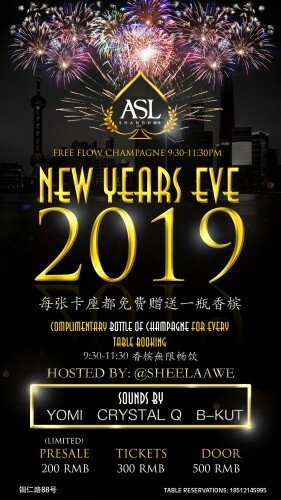 ASL Shanghai is the place to be on New Years Eve. With free flow champagne from 9:30-11:30 guests will want to arrive as early as possible. Table reservations will also be greeted with a complimentary bottle of champagne. 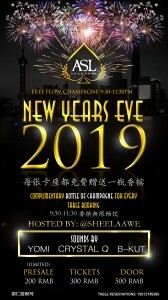 The night will be hosted by online personality SheelaAwe and SMTH, headlined by superstar DJ Crystal Q and supported by DJ Yomi and DJ B-Kut of The Hip Hop Hijack crew.